The Universal Basic Income (UBI) debate rages on, lately by Daniel Zamora in Jacobin and Matt Bruenig here at Peoples Policy Project. I’ll confess immediately that my jaundiced view of much UBI commentary coincides with that of Raymond Geuss, quoted by Zamora, to the effect that the UBI is a notion inspired by “nonrealist political philosophy . . . ideas formulated in complete abstraction from the existing world and real people, completely disjoined from real politics.” With the assurance of permanently alienating some readers, I could name a few more examples, such as the abolition of prisons or reparations. But I digress. First we need to get some terminology straight since the precise nature of the UBI tends to get mucked up in many treatments. A UBI is a fixed, unconditional payment made to a very broad category of the residents of a country, perhaps all citizens or all working-age persons, or just everybody. A negative income tax (NIT) is a payment that depends on the recipient’s income, and perhaps on the type of income. It reduces as the person’s income increases. If the definition of income is limited to labor compensation, you have something like the Earned Income Tax Credit, presently the largest program of cash benefits provided to low income families in the U.S.
On the surface, an NIT is not a UBI, though in actuality the size of the UBI matters. A UBI that provided some significant payment per person, say $10K annually, is intrinsically an NIT. The reason is that the government will be obliged to tax away the bulk of the benefit payments. 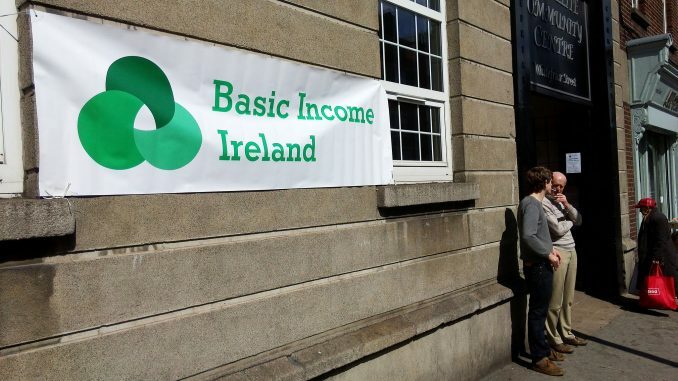 In effect the UBI award phases out as the recipient’s taxable income rises. The buried-NIT point was made by Samuel Hammond, a writer for the new-model libertarian Niskanen Institute, but it is usually ignored by UBI advocates who tout the virtues of the UBI for work incentives. The UBI is supposedly fixed, unlike the NIT, so you can work as much or as little as you like and your UBI benefit is the same. Sorry! If you receive taxable income, the bigger the national UBI, the more somebody pays in taxes as their income grows, whether from work or otherwise. So a big UBI, where “big” here refers to the princely income of $10K a year for everybody, has the same work incentives as a big NIT, because it IS a big NIT. Despite all that, I don’t really care about work incentives and the UBI, NIT, EITC, or free ice cream day at Carvel. The work incentive literature depends on unbelievable faith in marginalist micro-economic analysis. The idea is that you make decisions about work based on the financial effect of one extra or one less hour of work. What rubbish. Employees don’t usually have options for micro-adjustments in work hours. Even in the days of piece-work – immigrants slaving away sewing garments in the slums of New York City – I doubt that Great-Aunt Hedda was calculating the marginal returns from one blouse, more or less. People without money work as much as the boss lets them, or forces them to, up to their capacities if not beyond. In today’s precarious employment world, my presumption is that people allocate chunks of time. Whatever my limited options for work time, whether 20 or 40 hours a week, I want to know what I get; which option is best. It’s the total return in each case that matters. From my standpoint all the chatter about UBI “experiments” and the effect of a UBI on labor supply is beside the point. Most on the left want to see income guarantees. The question is how to do them, or in the context of the U.S., how to integrate income guarantees into our existing systems of means-tested benefits (“welfare”) and social insurance. I return to this below. Zamora disposes of the usual canards about the UBI and the mythical jobless future. Technology changes the composition of jobs. The Federal government controls the number of jobs with fiscal and monetary policy. Kids, back in the 1950s there was talk about “cybernetics” eliminating jobs. You know how that prediction turned out. The toxic angle on UBI and the facilitation of precarious employment elaborated by Zamora is well-taken, but it can be taken too far. We want income guarantees, and any guarantee has the potential effect of cushioning low-wage work. There is no getting away from it. Income guarantees will never replace labor income, and for the foreseeable future labor incomes will not adequately finance a respectable standard of living. The idea of a UBI facilitating labor market exit has been well-established, but so does any other kind of income guarantee. As Zamora notes, a UBI that is basic will be too expensive, and one that is affordable from a budget standpoint will not reach any sort of ‘basic’ threshold. But income guarantees, and not just the UBI, do facilitate reduction in hours of work. They expand the choices available to workers, and that is all to the good. Bruenig attempts to evade some of Zamora’s criticisms by proposing a variation on the gauzy UBI visions of the more philosophical types. In his scheme, the UBI would be financed by a sovereign wealth fund. The state would pay benefits out of income generated by its ownership of capital. The left version of a UBI would not displace existing benefits, nor would it have any negative bearing on work incentives. There are several problems with this argument, though I’ll note up front I have no problem with the government owning capital. Capital ownership by the state is equivalent to taxation, where the tax rate is 100%. I have no problem with that either. A sovereign wealth fund is a capital tax, and a confiscatory wealth tax gives you a sovereign wealth fund. Fine. The first question is where does the financing for the fund come from? From a socialist standpoint, we want the fund financed by capital, for the benefit of labor. We want a wealth transfer. It turns out not to be simple. If the state must purchase the capital, which taxpayers bear that burden? Imagine the purchase of capital assets with a payroll tax, to take one example. In that case dispensing the fund’s capital income is not a burden on capital, but on the workers who bought it. On the other hand, if we’re able to tax the rich to buy capital, why buy capital? We’ve already got the money. The source of finance aside, in these scenarios where the fund is financed by public revenues, a UBI is no more affordable with a fund than it is now. Question two. Why buy capital assets? If you have the dough, why not just stash it in the bank. It pays out just as easily. If the state expropriates the capital, we’re in a very different political world. In that unlikely case, there is a straight transfer from capital to labor, which everybody likes. But it’s the least likely scenario, absent massive industrial action. More likely, the state could exploit its command over certain public amenities. For instance, it could auction off departure and arrival slots at airports. In this case the incidence of the sovereign wealth fund’s expenditures is the incidence of the extra cost of airport slots. Doubtless some cost would be shifted to passengers, and airline passengers have above average incomes, but this is still not a clean transfer from capital to labor. Suppose a new natural gas strike is made under public auspices. We can ignore the climate change implications for the moment. That is also more like a clean transfer from capital to labor, along the lines of Alaska or Norway. The question then becomes the scope of such opportunities. The source of finance aside, supposing the wealth of a fund appeared out of thin air. Zamora asks the pertinent question: why would you use it for a UBI instead of about fifty other things we could think of? And why would you sit on the bulk of the money instead of deploying it quickly? No matter where the fund comes from, there are still implicit trade-offs in its use, between types of benefits, and between now or later. There are competing uses of public resources. Why is UBI the preferred one? That takes us back to the alternatives of collective provision and collective consumption. At the very least, expansion of the public sector ought to be devoted to more and better public facilities and services, freely available to all. We would still need income guarantees, because poor folks will still need cash. Since the bulk of personal income will be from work, and given likely budget constraints, the logical form of an income guarantee is some kind of negative income tax. The EITC doesn’t make the grade because, as important as it is, it’s conditional on work, and for various reasons some people can’t work. The scale of a new NIT is ambitious but still practical. Reversal of the Trump tax cuts would provide a nice start for an NIT. We already have a kind of national NIT. It’s called food stamps, or the “Supplemental Nutrition Assistance Program” (SNAP). It’s not as large or as flexible as we would like. You can’t use it to pay the electric bill. The real, logical source for a new NIT is a re-Federalizing of the failed spawn of Bill Clinton’s 1996 “welfare reform,” known as “Temporary Assistance for Needy Families” (TANF). A leading task for the left is to legitimize the notion of a new NIT that would replace TANF and supplement our other benefits, both means-tested and otherwise. What the hell, you could even call it a UBI. It should work in concert with, rather than replace, other means-tested or social insurance benefits. It would easily fit in the current Federal budget framework, rather than rely on the fantasy of a jumped-up Federal budget and tax system. It could put a serious dent in poverty and provide some relief from precarious labor market misery. All the evidence on the benefits of cash assistance for social outcomes, child well-being, etc. is pertinent. There are genuine ways to attenuate the power of Capital: progressive taxation, trade unionism, social ownership of public utilities (broadly defined), big social insurance, campaign finance reform, electoral reform. The naïve version of a UBI isn’t one of them. Its politics are a chimera, and its supporting analysis is loosey-goosey. Utopian ideas can be useful, but some pieces of the UBI-world puzzle are missing, and the rest don’t fit together.